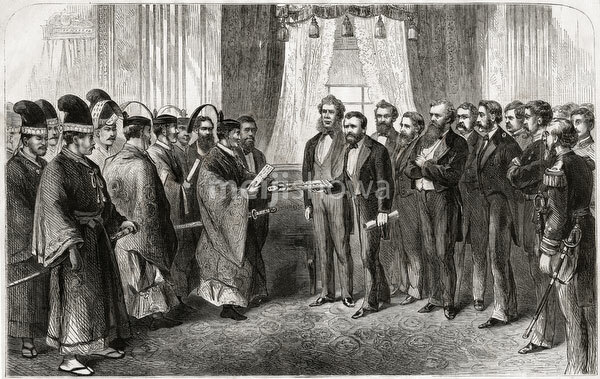 Illustration by James E. Taylor (1839-1901) showing members of the Iwakura Mission (岩倉使節団, Iwakura Shisetsudan) presenting documents to President Ulysses S. Grant (1822 –1885) and his cabinet in 1872 (Meiji 5). This Japanese diplomatic journey around the world between 1871 (Meiji 4) and 1873 (Meiji 6) was extremely important for the modernization of Japan. Originally published in Frank Leslie’s Illustrated Newspaper on Saturday March 23, 1872 (v. 34, no. 860). Wood engraving after a sketch by James E. Taylor.